I'm thrilled to say that Milton and Margie's Soy Wax Candles will be at Pitchfork Coterie Chicago this year. We'll be there with a lineup of soy candles in reused cans, retro mugs, and vintage glassware, along with the debut of a new line of perfume, beard oil, and beard balm. Details about the new products are coming soon! This year, the lineup at Pitchfork is super awesome. Hopefully, between selling my soy candles I can sneak out to see Brian Wilson performing _Pet Sounds_ (what!? ), Car Seat Headrest, Beach House, Girl Band, Julia Holter, and Twin Peaks. I'm happy to announce that our soy candles in reused cans are now live on Houzz, a hub for those interested in interior design, home design, and homewares. 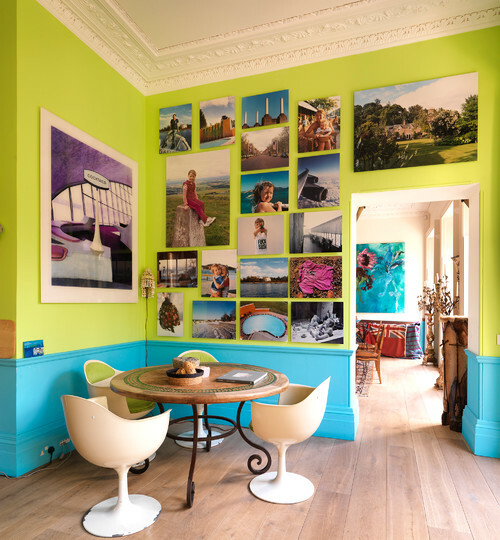 It's basically a big, happy place of home inspiration—you can browse designers' work, products, and stories about redesigns—in every style imaginable. 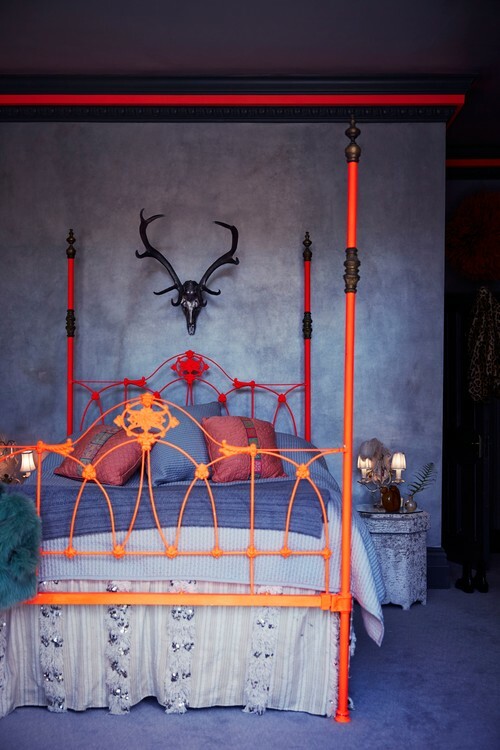 I am in love with this bed frame and the black skull over it. The color combination of red and orange has always just spoken to me. But I would probably go for something a little lighter on the walls and stick to the weird tile/wood that's in my apartment. Paper flowers really just make me happy. 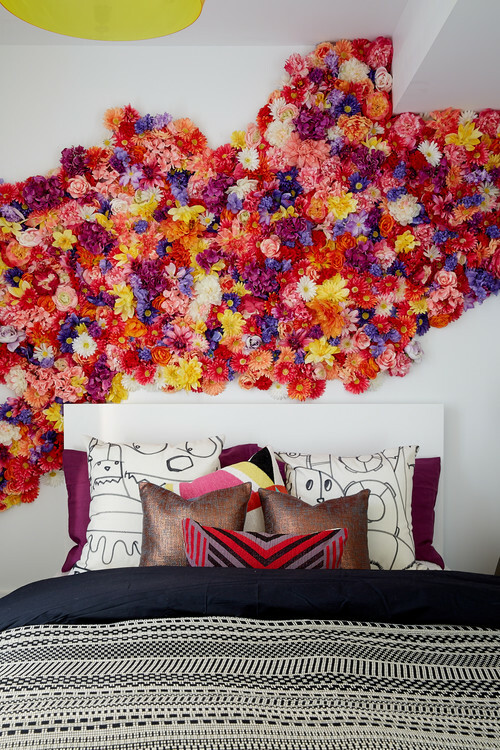 This isn't a bedroom design, but the color combinations and highly vibrant photos would be cheery. Juana Ryan, of StellaLily, rolls around the city in a mobile truck full of artisan wares, and I'm happy to report that Milton and Margie's is one of them. In addition to roaming Chicago, she parks at Chicago's festivals. Keep up with where she's going on Instagram, and snag our soy candles in vintage mugs and jars. Ever since I started Milton and Margie's Soy Wax Candles, I've made my tags in the same way: I'd hand stamp and cut out each and every one on paper with different patterns and colors. I know that sounds like a lot of pretty unnecessary effort—it was—but I enjoyed the process and convinced myself that it was cheaper—it wasn't. But this year, I'm trying to streamline my business by treating it more like a business, so spending a night stamping tags is getting cut from my schedule. I'm super excited to debut them! They're different enough to retain the eclectic feel, but will unite my line of soy candles across all my container styles. Let me know what you think. There is an essential oil for everything, and beards are no exception. After doing some online research, I came up with a beard oil recipe for the Groupon Style and Beauty Guide. This DIY oil had been beard-tested and beard-approved by the handsome model in the photos, so you can rest assured that the lucky recipient will sport a luscious, moisturized beard. If you're an avid collector of vintage glassware—like us—or you have a few pieces left over after burning Milton and Margie's Soy Wax Candles, we are happy to fill your cup. We will work with you to select your favorite scent and color of soy wax for your container. And for saving us a trip, refills come with a discount of 10% off. We love the little boost of excitement that comes with hunting down a '60s mushroom glass or Siesta Ware beer barrel mug at a thrift shop, and if you do, too, we'd love to transform whatever you find into a custom soy wax candle.